Those who have visited Oak Alley are familiar with it’s landscape: wide open pastures, ornamental plantings, outlying areas of sugarcane fields, and, of course, it’s namesake- the Alley. But what many don’t realize is that what we see today is only a small part in this cultural landscape’s complex story. With each development—from sugar plantation to rice operation, to livestock ranch—changes were made. Owners and tenants, alike, put up fences, tore down buildings and adjusted the landscape to fit their needs. As a result, as long as it has been open to the public, much of its history has been hidden…until now. 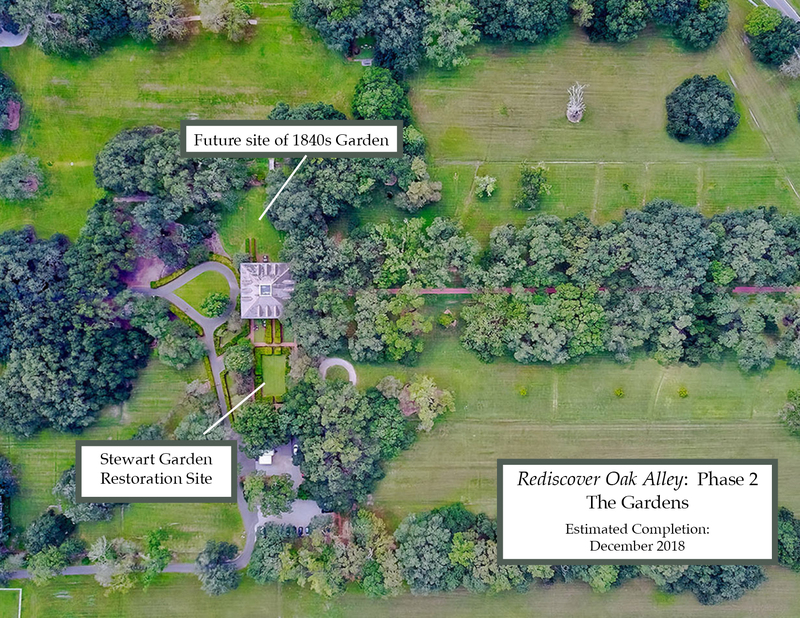 With Phase 2 of it’s ReDiscover initiative, Oak Alley Foundation will be working with CARBO Landscape Architecture to restore and/or interpret two key areas of its historic site: The Stewart Garden and a plantation-era garden. The Stewart Garden is most familiar to guests as the area with boxwoods adjacent to the mansion. After archaeological testing is completed, Oak Alley Foundation will restore and expand this over-mature area back to Mrs. Josephine Stewart’s original intent. The Plantation-Era gardens of the 1830’s-60’s are long gone, and live oaks currently occupy its original location behind the mansion. To meet this challenge, the Foundation will be developing an area upriver from the mansion that will include period plantings and interpret the social, cultural and practical role gardens held on slave-holding plantations. The garden areas will be undergoing archeological exploration and restoration through Summer 2019.